At least five people have been killed and 13 injured after a car bomb exploded near a police station in Somalia's capital. 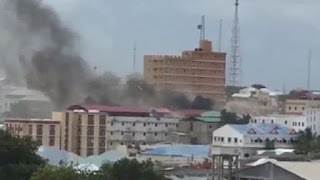 The explosion near Waberi police station on the busy Maka Almukarramah Road in Mogadishu may have been a suicide bomber, police said. Most of the victims were civilians and an eyewitness said he heard a huge explosion from the apartment he was staying in near Maka Almukarramah. Police say the exact target of the blast is not clear. The explosion ended a month of relative calm in the city, which is often a target for the extremist group al-Shabab.